The field is a rectangle measuring between 130 and 145 meters long and 80 to 90 meters wide. The goalposts form an H with the bottom part closed off by a net. The same field is used to play Hurling. 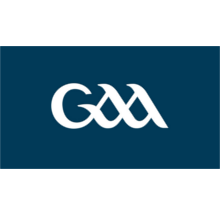 The GAA who governs the rules of Gaelic games made this decision to facilitate the use of the same pitches for both sports. The lines traced on the pitch are done at a distance of 13m, 20m and 45m out from each end. In Ireland, the teams are composed of 15 players with 15 possible replacements of which only 5 can enter a game. The goalkeep must wear a jersey of a colour different than the other players. 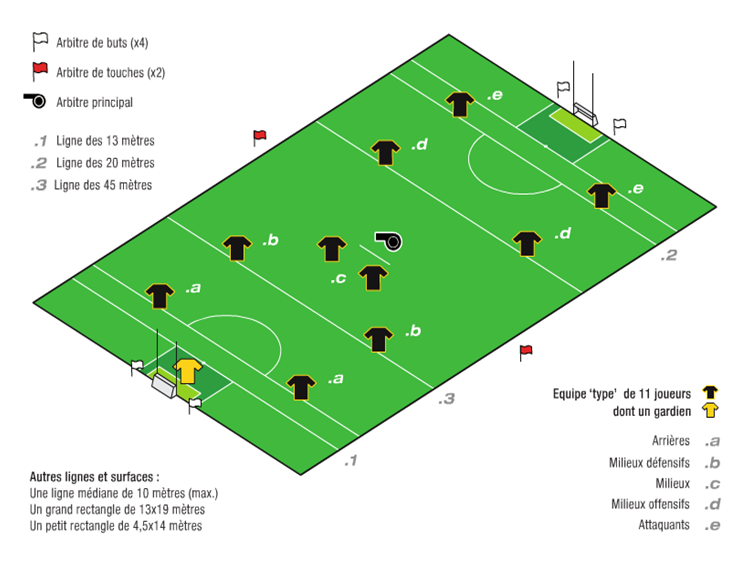 In continental Europe and adaption of the game has been made to allow use of soccor pitches (105m long vs 68m wide) for games played with 11 players each team. Typically the players are organized in 5 lines of two players: defenders, middle defense, midfield, offensive midfielders and strikers. The football is round and is played both with hands and feet and is similar to a soccor ball, but heavier to facilitate scoring high in the air. The ball is envelopped by rectangular bands which give it a look similar to volleyball. In Gaelic Football, there are up to 8 officials to manage a match. Referee: responsible for the proper conduct of the match. He keeps the score, judges the infractions of play, and applies sanctions where necessary. The other officials can assist the referee in the judgments of faulty play. 4 goal umpires (2 behind each goal) have the role to assist the referee in the confirmation of scores made by the players. 4 line umpires (one along each sideline) manage the football that go off the pitch and the return to play. 1 official to manage the time of play and replacement of players. 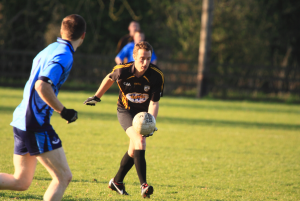 There are two manners by which a team can score in Gaelic football: the ball is hit into the net ( a “goal” worth 3 points) or it is hit over the cross-bar, between the posts (a “point” worth 1 point). The score is written for each team to indicate first the number of goals and then the number of points. In the example below, the scoreboard shows that Garristown lost their game against Liffré scoring zero goals and 3 points (total = 0x3+3 = 3 points) whereas Liffré scored 2 goals and 3 points (total of 2×6+3 = 9 points). Official matches generally last 2 x 30 minutes, with the exception of the All-Ireland final matches which are played as 2 x 35 minutes. In continental Europe the time of the matches is 2 x 30 minutes except when many matches are played throughout the day in a tournament where the duration of the games is adapted to the format of the tournament determined by the number of clubs participating. In the event the score is tied after regulation time, the match can be considered a draw, continued with 2 x 15 minutes of extra-time, or even have the entire game replayed. The player with the ball can run with the ball in his hands but can not advance more that four steps. In order to continue to advance with the ball in hand the player must perform what is known as a solo that would permit him to continue a further four steps. There are two times of solos: the dribble (similar to basketball and handball) and the toe-tap which consists of letting the ball drop to one’s foot to tap it back up to the hands. It is prohibited to perform two consequtive dribbles, however the toe-tap can be performed successively without limit. When the ball is on the ground the player can not pick up the ball directly with his hands. The player must initially touch the ball with his foot, knocking the ball off the ground and into his hands. 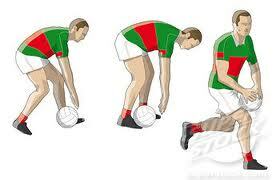 This technical maneouver, unique to Gaelic football, is known as the pick-up. The ball can be passed by long foot passes to reach players further downfield. For passes over shorter distances, the hand pass is done by holding the ball in one hand and then striking the ball from below with an open hand or closed fist ensuring that at the moment of the contact both hands are touching the ball. Physical contact is strictly regulated. Contact is only permitted if it is shoulder to shoulder. Tackling as is done in both rugby or football are strictly forbidden. In the event of a fault, the player puts the ball back in play with a foot pass taken from the spot of the infraction.